The stakes were very high indeed for the current design facelift of the CLASSIC 20, the medium-range loudspeaker in our CLASSIC line, if like the larger CLASSIC 30, an integrated bass module was to be designed that would eliminate the need for side grilles. Effective immediately, the CLASSIC 10, CLASSIC 20 and CLASSIC 30 thus feature the same design with sleek contours. There are differences only in the cabinet depth and naturally the chassis mounting. In order to achieve this goal, AUDIO PHYSIC once again blazed new and unconventional trails. The loudspeaker cabinet has a decisive influence on the sound of a loudspeaker. The larger an enclosure is, the greater the effort required to eliminate the acoustic characteristics of the cabinet and thus prevent tonal discolouration. In all the large AUDIO PHYSIC models, intelligently modelled loudspeaker cabinets guarantee the utmost in neutrality. In order to attain a comparable degree of signal fidelity, the cabinets on the CLASSIC models are designed as a sandwich construction made of several materials. The inner layer, 12 millimetres thick, consists of MDF (medium-density fibreboard); a proven material, solid, yet also possessing excellent dampening properties. Depending upon the design chosen, the CLASSIC 20 outer MDF panels are finished in fine wood veneers. The special feature in this case is a two-millimetre middle layer between two layers made of closed-cell high-tech acrylate resins. This design, similar to double glazing, helps to lend the walls of the CLASSIC 20 unusually low sound permeability – and thus interrupts the direct transmission of noise emitted in the cabinet interior through the panels of the loudspeaker to the outside. Little attention has been paid to this phenomenon, referred to as sound penetration, up to now, but in fact this effect may have a strong influence on the original signal. The joints created by the sandwich are a design element of the loudspeakers. The softer core works as a buffer zone, influencing adjacent materials that are more prone to resonance, transforming any partial vibrations immediately into thermal radiation. This type of design developed by AUDIO PHYSIC combines the optimal properties of all the materials used. As an alternative, we offer the CLASSIC 20 as high-gloss versions in black and white. Instead of MDF, the high-gloss versions have exterior panels made of glass. Here as well, the use of an extremely effective adhesive eliminates any possibility of the glass surfaces developing their own acoustics – the dreaded “ringing effect” associated with glass is nipped in the bud. Likewise, all the advantages of using glass as a material, such as its incredible stiffness, are fully retained. Due to the new cabinet technology, the sound performance of the CLASSIC models come very close to the virtues of the HIGH-END line and they simply set a new standard in their price segment. The new AUDIO PHYSIC method of designing cabinets is cutting edge. This results in ideal working conditions for the also newly developed chassis of the CLASSIC 20. The stunning design feature of the re-designed CLASSIC 20: the woofer is no longer placed on the sides of the loudspeaker, but rather – like its big sister, CLASSIC 30 – in its own compartment inside the cabinet. This offers visual and technical advantages: On the one hand, the side panels of the CLASSIC 20 now create a visually homogeneous unity whose contours are not interrupted. On the other hand, using an intelligent bass configuration with the woofer being mounted in its own compartment further reduces the impact of vibrations on the surrounding body. Combined with the bass reflex system integrated in the cabinet concept, this enables an incredibly precise and stunning low-tone fidelity with a powerful punch. A look at the transparent illustrations of the CLASSIC 20 and the bass module reveals the sophisticated configuration of the woofer near the base and the elaborate struts inside the cabinet that hardly diminish the inner volume, however. The listener is rewarded with not only highly-profound, accurate basses, but also with remarkably high definition and clarity in the mid-ranges and trebles. These precise qualities are also brought out by the newly-developed mid-ranges and tweeters; veritable high-performance drivers. Their architecture has been trimmed for maximum signal fidelity. The new midrange driver boasts narrow cone mounts, a fixed phase plug, an oversized drive and a fibre reinforced paper membrane. The perfect interaction of all components provides for neutrality and stability in the so vital mid-ranges that is uncommon for this class. The modern tweeter, with its fabric cap, reproduces frequencies ranging far above 20 kilohertz linear. It is surrounded by a radial felt mat shaped like a star, which facilitates uniform sound dispersion. Details that make a difference and underscore the extraordinary quality of an AUDIO PHYSIC loudspeaker. The logical consequence of this loudspeaker trimmed to low resonance and thus to neutrality is that, just as in the HIGH-END and REFERENCE line, we are now consistently using the expensive, technologically advanced WBT nextgen™ terminals as standard even in our “smallest” line. It is only logical and consistent, as these connectors, through their clever conductivity, eliminate ground storage effects and also noticeably minimise micro vibrations. With the CLASSIC 20, we achieve unprecedented original fidelity in this class that will surprise you. Typical cabinet sound, which at first flush can appear cosily and pleasingly warm, is alien to these models. 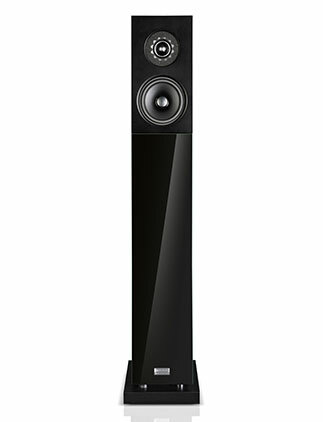 The CLASSIC 20 loudspeakers reproduce the signals provided by the electronics and software – in this, they are closer to models in the HIGH-END line than ever before. The 3-way speaker features three different drivers that share the audition spectrum. One or more woofers, a midrange and a tweeter. Usually the frequency separation between low and mid frequencies is set between 150Hz and 300Hz, while the crossover frequency between midrange and tweeter is usually set between 2000Hz and 3000Hz.